More than 1,200 Cedar Falls Utilities (CFU) customers have invested in a new 1.5 MW dc community solar project near Prairie Lakes Park in Cedar Falls, Iowa, now completed by SunLink Corporation and RER Energy Group. The U.S. solar market is set to grow a staggering 119 percent this year says GTM Research in its latest “U.S. Solar Market Insight Report 2015 Year in Review“, published in conjunction with the Solar Energy Industries Association (SEIA). Figures released on yesterday by utility solar authority Wiki-Solar.org show that global capacity of large-scale PV generating capacity exceeded 60 GW at the end of 2015. More than 22 GW of new plants were commissioned in 2015, setting a sixth consecutive annual record. 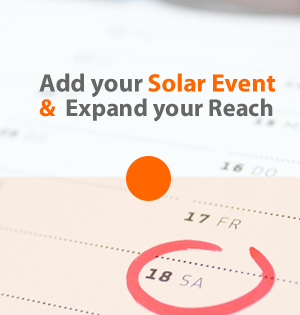 Quick Facts: Event type: 5-day trade mission Where: Vietnam and Thailand When: 18-22 April 2016 Solarplaza, a leading international solar industry event’s organizer, has announced a 5-day trade mission, which will take place from 18th to 22nd April 2016 at Vietnam and Thailand.